Black Beauty is an unforgettable story. I have never been on a horse, but Anna Sewell’s book made me identify with this gentle, constant character, who sometimes received cruel treatment but was always loyal to those who cared for him. This autobiography, published in 1877, was written as a lesson for those thoughtless people who mistreated animals without a thought. Through the stories of Beauty, Merrylegs and Ginger we witness all aspects of Victorian society and the hope of Anna Sewell that mankind would begin to treat animals with care and respect. Written in the first person, Miss Sewell used anthropomorphism to give the horse human feelings and emotions with which the reader could identify. Dying a few months after the books publication, she was aware of its widespread popularity but perhaps not that it would become one of the best-selling books of all time. From 1972 to 1974 a popular TV series was shown on Sunday afternoons. The Adventures of Black Beauty told further stories of what might have happened during Beauty’s life. A time-slip novel about the choices women make, the healing power of horses, and the devastating consequences of human error. Caroline Walker’s daughter suffers a horrific riding accident. Her distraught parents wonder if she’ll ever walk again, let alone ride. And when Mollie’s blood group is discovered as rare, her husband offers to donate blood. Except Ian is not a match. In fact, it’s unlikely he’s Mollie’s father. Eighteen years previously, Caroline had a one-night stand with Irish rock star, Rory O’Connor. Caroline fell pregnant. Deeply flawed boyfriend, Ian, was overjoyed. And Caroline’s parents were simply grateful that their daughter was to marry into the rich, influential Walker family. Never look a gift horse in the mouth. 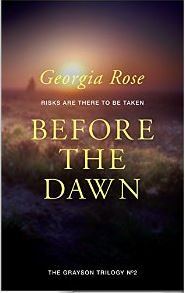 Caroline turns to Rory’s friend Connor; and although his almost spiritual connection with his horses appears to be the balm she needs, Caroline cannot forget Rory, or her youth – both lost to a man she never loved. Eighteen years on and after surviving cancer Rory lives as a virtual recluse in the Welsh mountains. Through his well-meaning but interfering sister, he is shocked to discover he has a teenage daughter. Or does he? As the truth begins to unravel, Caroline finds herself faced with a complex trail of moral dilemma. Caroline has it all, a rich successful husband, a large beautiful home and a daughter they both love. But Mollie’s terrible accident while competing on her horse, Sahara Sun, exposes cracks in their apparently happy life and Caroline’s past catches up with her. Can she take Mollie from Ian, the father she loves so much, and will Mollie ever forgive her secrecy? Travelling back to the millennium we join Caroline and her flat-mate Niamh at a party in the Welsh hills. Already in a relationship with Ian, she realises that the life she will have with him will be very different from that lived by Niamh and her charismatic pop-star brother, Rory. Will one night of happiness change her path or be a last fling? However, this tale is more complex. More mistakes are made in 2017. As Mollie struggles to come to terms with her injuries, Caroline hopes that she will agree to try horse therapy with Connor, an unusual man who helps people to cope with pain and confusion through their interaction with horses. Meeting Niamh and Rory again, adds further complications as she strives for independence, developing her illustration business and facing up to her own weaknesses. Gift Horse is an unusual novel which shows the shallowness of material wealth and respectability, but it also deals with crises of injury and betrayal. I was expecting more details of the horse therapy, which I would have enjoyed but perhaps that might have loosened the taut plot and surprising conclusion. A remarkable story of a woman discovering her destiny. This week I am interviewing a book character from the Wild Water series, whom we love to hate. My conversation is with Jack Redman’s beautiful wife Patsy. Even after she cheated on him, she remains a significant part of his life as the mother of his children. Patsy, you seemed to have everything when you were married to Jack; a beautiful house, a hard-working husband, delightful children. So why were you unfaithful to him? Oh, rubbish! Everyone only ever sees Jack’s side. He was a workaholic when I was married to him, just like his father, and look what happened there… I was unhappy, neglected, and bored. I didn’t plan to be unfaithful – it just happened. I know everyone says that and I admit I was stupid to fall for Philipe’s promises and his plans: yes, he had an amazing business plan for combining my beauty salon and his hairdressing chain but, well… things change and it progressed in a different direction from there. I suppose it was inevitable it all got in a mess since Jack was never around and Philipe just kind of ‘got me.’ Above all, he understood fashion and style in a way Jack never did. And anyway, Jack’s behaviour was no better. He couldn’t wait to get Anna Williams into bed the minute my back was turned. Your daughter Lottie seems such a lovely girl, but are you finding her behaviour rather challenging as she grows older? Lottie and I have never seen eye to eye, she was always a daddy’s girl. Still is, always will be. Which is why I made the decision to move away. It wasn’t easy, but I did it for her and Jack, in the end. You don’t believe me, do you? It’s true. Lottie has never needed me in the way that Oliver and James have. Even Chelsey was far more independent, but she’s another story altogether, isn’t she? Actually, I don’t want to talk about Chelsey because my words will be twisted and everything will come out about Banks and that awful, awful time when he… well, as I said, I’m not going to be drawn into that other than to say that Jack and Anna had a lot to do with it, surprise surprise! As for Lottie, she’s happy enough. She’s going to stage school, that’s the last I heard. What do you think about Anna? In other circumstances could you have been friends? Haha! Anna? There are no circumstances where she and I would ever be friends. What on earth do we have in common? She’s a mess! She lived in a falling-down farmhouse surrounded by swamps of mud before Jack sunk a load of cash into it. So far as I know she still looks and behaves like a hippy from the seventies; long straggly hair, big boots, dirty skirts. Does she still waft incense sticks around and make her own polish out of beeswax? She used to be boring when we flat-shared in our student days but these days she takes it to a whole new level. Lottie told me the other day they baked liver biscuits for the dogs and dug up mealworms on the beach, so that says it all. Anna Williams has always been, and still is, fat and uninteresting, and she stole my husband. Why do you spend so much time and money on shopping? Are you depressed? I did go through a stage of depression after losing everything, but I met another man, and you know how it is, some things just fall into place and I gradually got my mojo back. I love shopping, so why not? There’s nothing more satisfying than filling the boot of my car with lots of shiny bags. I don’t think it had anything to do with my depression… I see shopping more as a hobby, so in the end I think it helped me. It has to be better than taking pills, surely? Some people call you manipulative, but do you really deserve our sympathy? Do you know, I’ve never asked for sympathy but yes, I do think I deserve a least a little. I’ve had a really hard time with my family. My parents, for example, have been no support at all. I know I had to move back in to their place and I was grateful for that but emotionally, you know? I’ve never felt good enough for them, nothing I could do to impress them. And it’s the same now. Another reason I moved away. I can’t see where I’ve manipulated anyone… I don’t know what you mean. Oh, do you mean all those complicated paternity issues with Jack? Look, I did what I thought was for the best, for the children, at the time. I honestly think I deserve some credit for that, it wasn’t easy, holding it all together. I’ve no hard feelings towards Jack. I’m in a better place now. Although, I do miss him sometimes, after all we never forget our first love. I wonder if he thinks about me? Palomino Sky continues the story of Laura and James who met in Midnight Sky. Now they are looking forward to a happy life together as Laura plans their wedding and tries to set up a new home design company. James wishes to start anew by selling the farm and the equestrian business and looking for another home, but Laura has reservations. In this book, Laura’s sister, Maggie, gains strength as a character and in practical ways. She is faced with increased problems form her wayward daughter, Jess, but she takes constructive action to help Laura and James as their lives take a tragic turn. Towards the end of the book we lose touch with Laura, but this is because she needs to step back from events, feeling lost herself. The bleak winter landscape of Snowdonia is beautifully described by the author and the awe inspiring sight of the gathering ponies is starkly contrasted by subsequent events. As the horses are sold or returned to their owners, the healing hope of the mare, Palomino Sky, whom Laura calls Song and the dependable sturdiness of O’Malley, show a light at the end of the tunnel which might bring James and Laura back onto the path to happiness and give solutions to those affected by the closure of the stables. This is an emotional story which grips the reader from page one. I really cared about the characters and read late into the night to discover their fate. 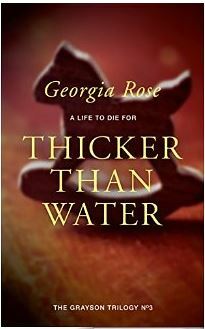 Thicker than Water is the final book in The Grayson Trilogy by Georgia Rose. It draws together the romance and dramatic events of the first two books in a revealing denouement where Emma Grayson discovers the truth about her past, in a terrifying situation. Although not as long as the preceding books Thicker than Water contains scenes of passion and deep emotion. We fear for the continued happiness of Emma and her husband Trent as they deliberately put themselves into great danger. Will the teamwork and training of others on the Estate be sufficient to save them? All three books of this series have a different structure and focus, making it impossible to categorise them as purely romance or action-thriller. We come to understand Emma deeply and share her feelings and emotions as she opens up to others and allows herself to love again. I was slightly disappointed that this book ended fairly quickly and then I found the rewarding extra which was added at the end. NB Please don’t look at this first! Georgia’s writing is a breath of fresh air. She has grown with each new novel and she is not afraid to experiment with her approach. In Thicker than Water the writing is frank and explicit, so that as a reader you become completely involved in each crucial event. 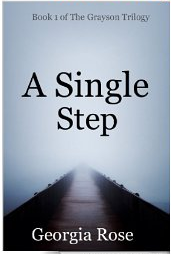 Although A Single Step and Before the Dawn can be read in isolation, this final novel needs your commitment as a reader to the back story and that commitment is well rewarded. 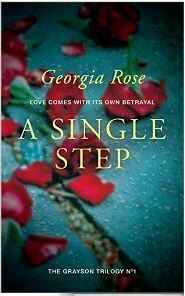 “A Single Step” begins with the ideal setting for a romance. Emma Grayson is starting a new life at Melton Manor, a large well organised estate, where she will manage the stables and groom the family horses. She soon meets the large friendly estate staff and despite her reticence to become involved she makes several friends. The only drawback is Trent, the stern Estate Manager, who appears, to the independent Emma, to be controlling and overbearing. We gradually learn about Emma’s tragic past and why she is reluctant to become involved in a relationship even with the charming and helpful Carlton. She proves herself to be competent and enjoys her life with the horses and the two young children who come to ride. It is pleasing to see the way in which Em’s prickly exterior is broken down and passion begins to emerge as she is enticed into love in spite of her attempts to sublimate her feelings. But there is evidence that Melton Manor is not paradise after all. Trent and his employer Lord Cavendish disappear for several days at a time, often travelling in a military style helicopter. Emma is involved in an accident caused by a mysterious stranger. She begins to fear for her life and future happiness. After the first few pages, which brim with self-conscious prose, the book springs to life in the dialogue between Emma and Lord Cavendish. Their characters are quickly established and this made me want to read on. The story is filled with detail, especially about how to look after horses which for me was not especially interesting but the well-crafted plot, strong characterisation and thrilling denouement made this book an excellent read.